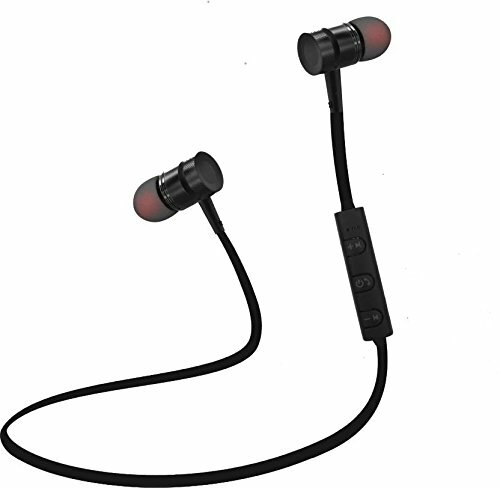 Envent is back with a fresh device up in its sleeves which is Livetune 505 Bluetooth Earphone with Magnetic Locking Design (black not grey), a pretty affordable device to pick. It comes with a decent look, built and sound experience for its customers. It accompanies you while jogging, running or travelling anywhere because of its fitting and design. So let’s see the Envent livetune wireless Bluetooth headset with mic review so that you can understand it better. This new Envent audio device is worth Rs. 1,399 on AMAZON but its original price is Rs.1,999, so you can save upto 30%. A small micro USB cable for charging. A user manual to help you understand the process of using the device. A warranty card that holds 6 months warranty. The Envent Livetune 505 headphone is a magnificent audio wear when it comes to look and built quality at a reasonable price to offer. It offers a charismatic and well-fitted design for you. Livetune 505, comes with attractive black colour and black translucent eartips with a red colour in its core. It fits perfectly in our ears with the help of suitable eartip sizes provided with it. But you will be little disappointed here in term of weight(16 g) & angled design. Weight and absence of angled design of earpiece, this cause earphone earpiece to fall off from the ear while doing any exercise or running. Livetune 505 has a Flat tangle-free rubber cable along with adequate length so that you will move around freely without any hassle. And an in-line mic that has control buttons to easily change songs or adjust volume, receive or reject calls and to turn ON/OFF the device. If I talk about the build quality of in-line remote, then it was not upto the mark. Additionally, It is sweat proof which makes it a good companion for jogging, running and during gym workout sessions. The most important thing about any audio wear is its sound experience, if the sound produced is not up to the point of satisfaction then it’s a total waste of money. But Livetune 505 was up to the point and provides good sound. I have tested it with quite a range of songs in Hindi, Punjabi and English songs of different genre like rock, pop, metal, classic and more. But would prefer to share the experience of Harry Potter music tribute and Pirates of the Caribbean theme songs by Tushar Lall. The sound produced by various instruments gives a clear, vivid, detailed and great experience. At low, medium or even at full volume, the sound experience was awesome. The bass and treble both are perfectly good considering the price. Both the bass and treble are in proper and well balanced. But remember the Bass is only well-balanced here and it is not for the Heavy bass lover. I would recommend you to use burn-in apps(like Burn-in Audio) available in Google Play store to warm up your Bluetooth device before using it. Listening song for a long time at high volume, Livetune 505 does hurt a bit and it is also not safe for anyone to use any device for too long at the volume more than 80%. Noise cancellation was a good for this price. As Livetune 505 is going to be a good companion while travelling because it has a good noise cancellation. Even though you’re surrounded by the noise, you will still listen to your audio. Also, if you are getting disturbed by outer noise too much then try using other sizes of eartip. Livetune 505 was loaded with latest Bluetooth version 4.2, which has universal connectivity. Now about the range, which was within 10meter (approx.). This leads you to enjoy everlasting music or take calls even though your phone/laptop is somewhere else in the house while you are cooking or doing any other work. It can easily be connected to any device without being troublesome. With just a click on the POWER button, Livetune 505 will come to life with a red/blue blink and computerized audio of “Power ON”. As soon as it’s turned ON, you can connect Livetune 505 with any device by turning their Bluetooth ON. It connects/disconnects with an audio “connected/disconnected”. It’s very easy to use and handle. Now coming to the battery life, Livetune 505 has a battery life of 4 to 5 hours with a full charge. It takes nearly 1 to 2 hours for it to fully charge with the mini USB cable provided within the box. Envent livetune 505 charging is done via a normal android adapter. The battery backup is low as compared to other Devices like 1More iBFree, Boult Curve Earphone and Taotronice Wireless Bluetooth earphone. Being packed with Bluetooth v4.2, the connectivity during a call is perfect. This provides decent, loud and clear sound quality during any calls. We were easily aware of the incoming calls as it starts ringing and by default, the music is paused and let you take the call. We had a wonderful listening experience with Envent Livetune 505. The company has included Bluetooth v4.2 to this device so, that it can maintain a strong signal strength. In case of design, it is a premium looking device which is ready to impress you with its impactful design. But sometimes it feels that the Bluetooth module has made the earphone a bit heavier and it comes falling down easily. One thing which we highly appreciate of this headset is its magnetic lock function which looks absolutely stunning. Overall it is perfect workout partner for you. And, If this earphone didn’t complete your wishlist then go for Boult Curve Earphone and Taotronice Wireless Bluetooth earphone and if your budget is high then for sure go with 1More iBFree Bluetooth earphone. Nice Article. But I would recommend you to reduce the no. of ads. These ads are not good for Readers. I hope you would understand.